Dubai: President His Highness Shaikh Khalifa Bin Zayed Al Nahyan will be honoured on Tuesday as the Dubai International Holy Quran Award’s Islamic Personality of the Year. * Image Credit: Supplied * The “Khalifa” coin features a portrait of His Highness Shaikh Khalifa on one side, and on the other, Burj Khalifa, the world’s tallest tower. The announcement was made on Sunday by Ebrahim Mohammad Bu Melha, Adviser to His Highness Shaikh Mohammad Bin Rashid Al Maktoum, Vice-President and Prime Minister of the UAE and Ruler of Dubai, on Cultural and Humanitarian Affairs and Chairman of the DIHQA Organising Committee. The decision to select Shaikh Khalifa for the award comes in recognition of his role in serving the religion of Islam, Muslims and humanitarian causes around the world. 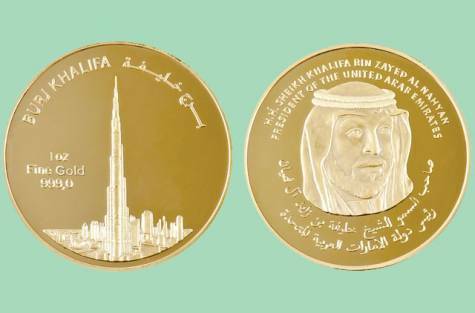 Featuring a portrait of Shaikh Khalifa on one side and the Burj Khalifa, the world’s tallest tower, on the other side, the coin was issued in recognition of the visionary leadership of Shaikh Khalifa. The Dubai Multi Commodities Centre Authority (DMCC), the Government of Dubai entity dedicated to enhancing commodity trade flows through Dubai, which designed the coin, unveiled the prototype at a special ceremony. The DMCC is also in discussions with the UAE Central Bank to designate the gold bullion coin as the first legal tender in the UAE and the Middle East as a whole. A national legal tender gold coin will stand as an internationally recognised symbol of pride and recognition of the UAE’s achievements — much like the Canadian Maple Leaf, Australian Nugget, South African Krugerrand and others. Ahmad Bin Sulayem, Executive Chairman of the DMCC, said the innovative gold bullion coin was conceived to satisfy the demands of investors seeking access to gold as protection against the ongoing global economic uncertainty.